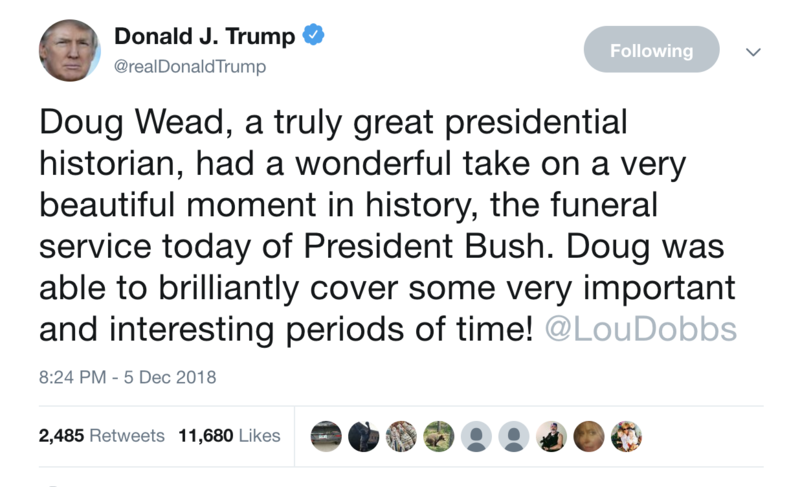 What Ronald Reagan said about Doug Wead may surprise you. This was the segment Trump Tweeted. Wead answers Cuomo in 60 seconds. ​Why America is a great country? Wead on Maria Bartiroma - FDR: "sometimes you have to walk with the devil to get across the bridge." Doug Wead is a historian and New York Times bestselling author of more than thirty books. He has served as an adviser to two American presidents and was a special assistant to the president in the George H.W. Bush, White House. He has interviewed six presidents, seven first ladies, and co-authored a book with a president. He has served as Co Chairman of the Charity Awards with first ladies, Lady Bird Johnson, Rosalynn Carter, Nancy Reagan, Barbara Bush and Laura Bush. The presidents and their familes. HILLARY CLINTON AT THE EXACT MOMENT SHE LEARNED SHE HAD LOST. CNN PANEL IS TOTALLY BAFFLED BY DOUG WEAD'S POINT. BUT VIEWERS GET IT AND COMMENTS POUR IN ! THE SURPRISING COMPARISON BETWEEN TRUMP AND OTHER PRESIDENTS IN THEIR FIRST 100 DAYS. MSNBC TRIES TO COMPARE TRUMP TO WATERGATE BUT IT GOES HORRIBLY WRONG. New book offers account inside Clinton election night HQ, Shouting, smashing of glass. Three pundits who said Trump would win! Ann Coulter, Sean Hannity and who else? Remember when Malia and Sasha first arrived at the White House? Start Reading "All the Presidents' Children" in less than a minute on kindle. Start reading "The Raising of a President" in less than a minute on kindle. What do Washington, Obama, Hitler have in common? How Obama rates as a father? "Gentle but firm." Abraham Lincoln : "Good president, bad father?" Two Bush presidents, father and son, Lessons for Fathers Day? Gerald R. Ford and his abusive father. See CBS - Doug Wead account of Marilyn Monroe and JFK. ​HOW A PRIVATE CITIZEN SAVED LINCOLN'S LIFE.